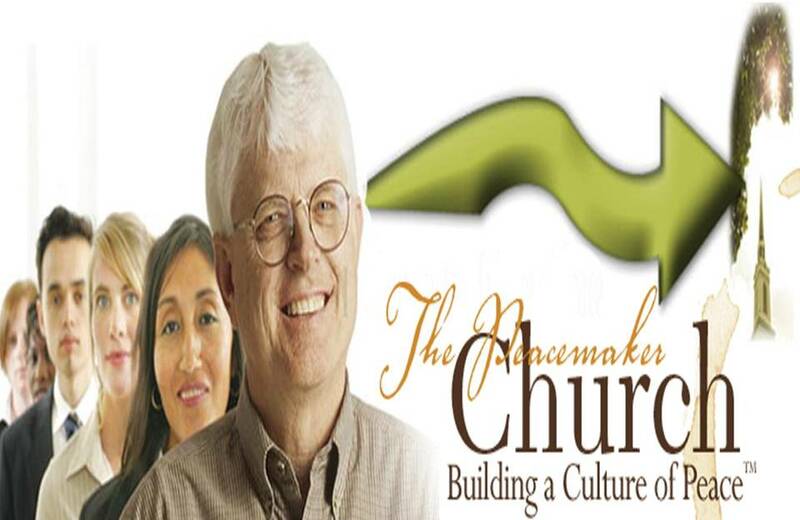 Our church is going through a series of studies and messages aimed at building a culture of peacemaking. A well-known fact of church life is that most Christians deal with conflict in a way that does not bring honor to Jesus Christ. Most mature churches and Christians wear battle scars from at least one serious conflict in the past. Our church experienced serious conflict two years before I came, and yet the effects are still being felt. God has led me to seek out how to use the Gospel of Peace to build a culture of peacemaking in our church, to develop a body of believers who do not run from conflict, but see it as an opportunity for the Gospel of Christ to become more powerful in our church and community. Ken Sande and his “Peacemaker.net” are the powerful resources we are using. I heartily recommend them. This post is the first of eight based upon the series of sermons used in that peacemaking series. 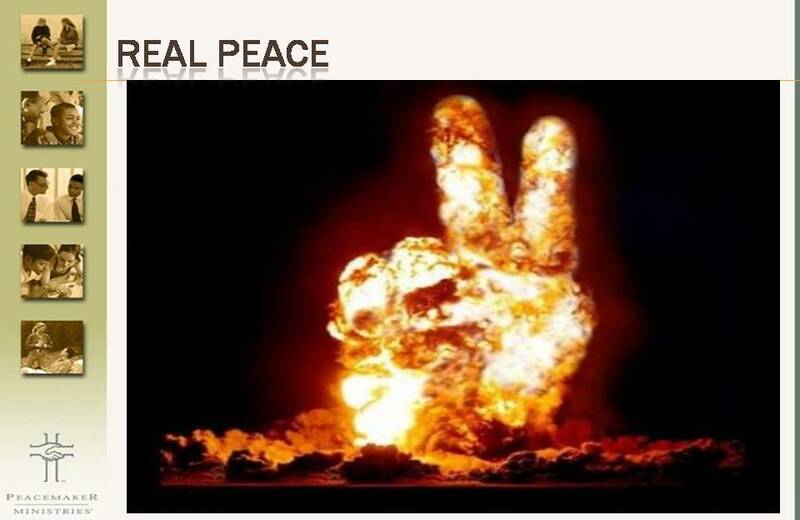 If you do a Google search and type in the word “peace” you will get 323 million sites which relate to “peace”. There are 232 million images relating to “peace”. That’s a lot of interest in peace. That’s a lot of advice on how to have peace. People are much hungrier for peace than I imagined! As I glanced over many of the summaries, I learned that there are articles about the Peace Corps, peace prizes, peace poles, peace colleges, peace endowments, peace gardens, peace institutes, and peace protests. There are women for peace, Jews for peace, Buddhists for peace, religions for peace, musicals for peace, and children for peace. The list goes on and on … 323 million web sites and articles dedicated to peace! If you examined these pages, you would discover an amazing assortment of formulas for finding peace. While some of these formulas are noble and inspirational, many are simplistic and superficial. Remember the song, “All we are saying is give peace a chance”. Nearly all of them are based on human efforts to resolve conflict and get along with others. Although some of these efforts have encouraged temporary peace, few of them can report genuine, lasting results. And nearly all of them fail to address the ultimate reason there is so little peace in this world. He is the image of the invisible God, the firstborn over all creation. 16For by him all things were created: things in heaven and on earth, visible and invisible, whether thrones or powers or rulers or authorities; all things were created by him and for him. 17He is before all things, and in him all things hold together. 18And he is the head of the body, the church; he is the beginning and the firstborn from among the dead, so that in everything he might have the supremacy. 19For God was pleased to have all his fullness dwell in him, 20and through him to reconcile to himself all things, whether things on earth or things in heaven, by making peace through his blood, shed on the cross. In this brief passage, God provides a more robust, promising, and exhilarating formula for real peace than do all the millions of articles, speeches, and books written by men since the world began. His answer to our hunger for peace may be summarized in five key principles. 1. 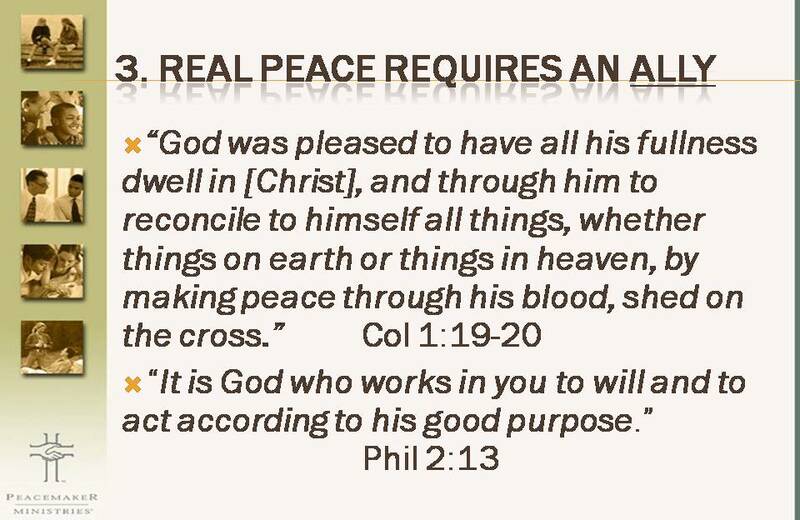 Real peace is a Priority to God. Consider who God sent to restore peace in a broken and conflicted world. He did not send an angel, mighty as they are. He did not raise up a mighty army to suppress conflict, enforce justice, and impose unity on the nations. Nor did he did send a delegation of gifted men to teach us how to find peace. This was no casual or last minute assignment. As 1 Peter 1:20 tells us, Jesus was chosen for this task “before the creation of the world.” God’s priority for peace is emphasized by the fact that he planned for reconciliation even before the world and all our conflicts came into existence! Since God has made peace one of his highest priorities, he calls us to do the same. He does not want us to treat estrangement from him or others as an insignificant matter. He expects us to make more than a token effort to seek peace with others. He teaches us never to delay going to someone who may have something against us. In fact, his priority for peace is so high that Jesus commands us to seek reconciliation with others even before we seek to worship God himself! 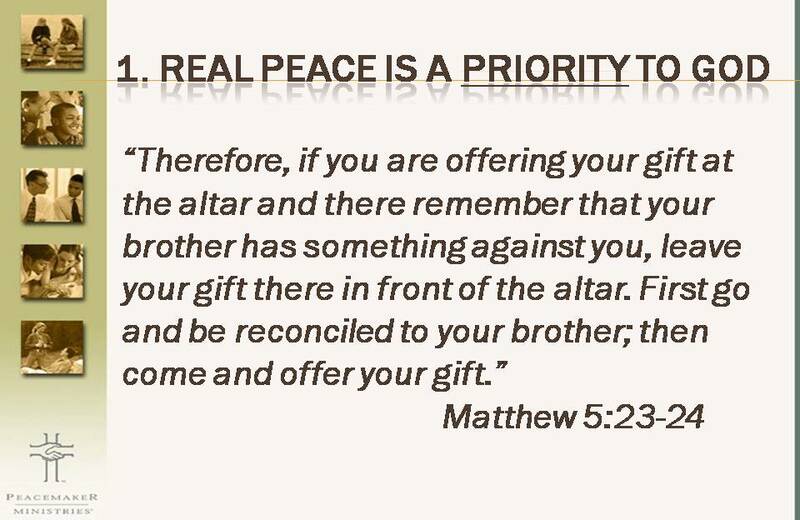 What more could God say to indicate how high a priority he places on peace? Peace between Christian brothers is so important that God doesn’t want your money nor your worship until you seek to make peace. Yet how many Christians worshiping each Sunday have family members they don’t even speak to any longer? Is there any wonder that Christians are often viewed with skepticism and derision. God realized the importance of peace when He sent his most exalted ambassador to make peace on earth. And he commands us not to approach him to worship unless we have made every reasonable effort to seek peace with those around us. By his example and commands, God has placed peace at the top of his list of priorities. Let us do likewise! 2. 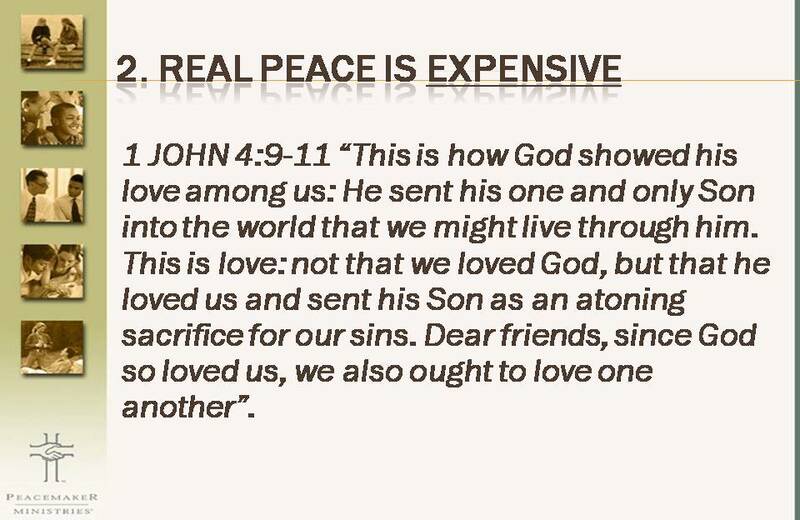 Real peace is Expensive. Consider the price that was paid to purchase our peace. The Son of God had to leave the glory of heaven, descend into a fallen and corrupt world, take on the form of a helpless baby, walk countless miles over deserts and dusty roads, submit to mocking, beating and torture, and shed his own life’s blood on the cross. What price can we place on these services? As the only Son of God, Jesus’ life and blood was infinitely precious. If his atoning work could somehow be converted into pure gold, all the vaults in the world could not hold the resulting treasure. 1 John 4:9-11 “9 This is how God showed his love among us: He sent his one and only Son into the world that we might live through him. 10 This is love: not that we loved God, but that he loved us and sent his Son as an atoning sacrifice for our sins. 11 Dear friends, since God so loved us, we also ought to love one another”. Note the response that God is looking for in us: if we understand and treasure the love that he has shown toward us, we will be eager to be a channel of that same love into the lives of others. If that love is flowing through our lives, we will be willing and even eager to pay whatever price is necessary to be reconciled with others, just as Christ paid an infinitely expensive price—his very life!—to be reconciled with us. 1 Peter 5:6 says, “Humble yourself under God’s mighty hand.” Will you humble yourself, stop trying to prove your own righteousness, cast aside your lifelong tactics for resolving conflict, and follow God’s path for making peace, no matter how difficult it may be? Will you stop dwelling on what others have done wrong and confess, in detail and with sincere sorrow, how you have contributed to a conflict or broken relationship? Will you admit that others may understand a conflict situation more accurately than you do? And will you give as much effort to identifying and meeting their interests as you do your own? What about the person who has deeply wronged you? Gossiped about you? Betrayed your trust? Failed to keep a commitment? Damaged your property or reputation? What price will you pay to encourage that person’s repentance and restore peace in your relationship? Will you let go of bitterness? Will you give up self-pity? Will you divest yourself of the desire to make that person suffer for the wrong he or she has done to you? 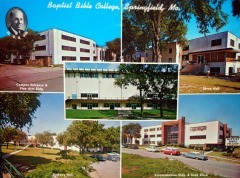 At Baptist Bible College, I was elected the Senior Class President. I was the first single student to do so in the 24 years of the college at that time. A married man would win because the majority of students were married. (Kind of strange today but common for Bible Schools at the time). As such, I was under much scrutiny and unfortunately there were people who resented the election results. Young single students were considered immature. After all, this was a coveted position, one which meant you could get a great job with a great church after graduation. 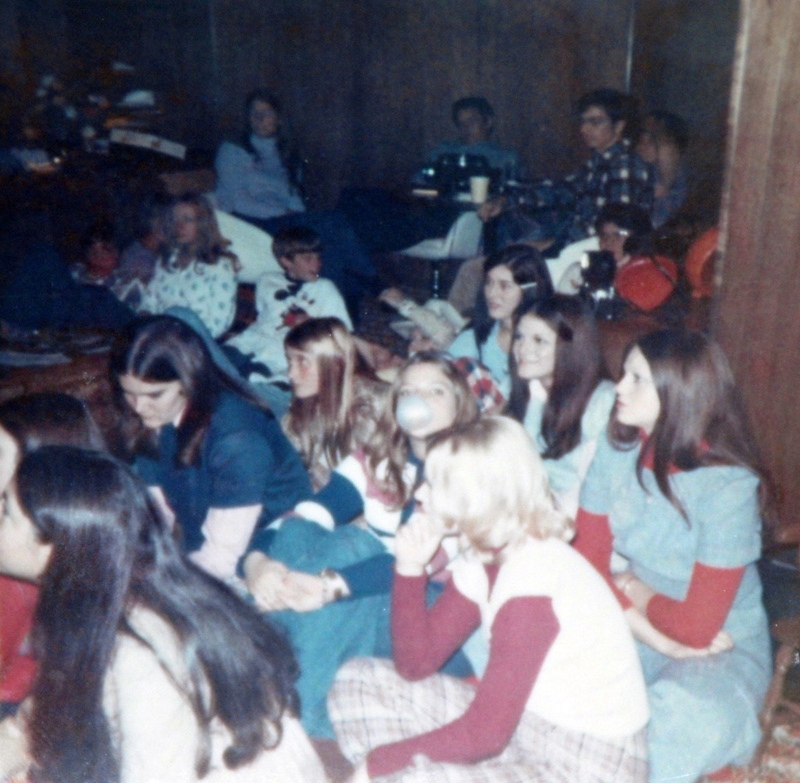 My Dad was teaching a adult Sunday School class at Overland Park Baptist Temple, and Pastor Bob Perryman decided to have a contest to see which class could have the most people one Sunday in October, 1973 . The winner got to cut the tie of the loser. I believe the other class was taught by Ken Wohlgemuth. Dad asked me to pad his class by bringing up some friends from BBC. I had so many friends want to come that Dad had to rent a school bus. There were about 40 kids who came up for the weekend and stayed at our house. I still have people reminding me of how great a time they had. My girlfriend (Lydia Langston) had to work later than the departure time of the bus, so I went to the assistant Dean of Students, Tom Sooter, to see if I could drive up separate from the group. (It had been a big deal to get permission for the group to go). He agreed to let me drive with Lydia as long as another girl drove with us (this was standard policy anyway – you always had to have a ‘chaperone’). So we all went to Overland Park, my Dad won the contest, we all had a super great time and I though everything was great! The Tuesday following the trip, I got called into the dreaded “Discipline Committee” meeting. They said that I had not received permission to drive up apart from the others, and that because of my disobedience, I would have to speak before an assembly of all the Seniors and resign as President. I was in shock. Tom Sooter was in the meeting denying he had given me permission. Nothing I said mattered. I wanted to strangle him. I was filled with rage. Two days later at an assembly before 900 Seniors, I gave my resignation speech, explaining that I had failed to follow the rules of the college, and had made a serious error in judgment. It was short and to the point. You could see the suppressed smiles on the faces of the married students. I still remember the shocked expressions of my friends. I remember leaving without speaking to anyone and walking quickly to my room. In our room there was an unused closet that we had turned into a carpeted prayer closet. My roommates were in class, and so I spent the next two hours hunched over in our prayer closet, crying and crying and crying before my Heavenly Father. I had never been lower in all my life. My guts had been ripped from me, my heart had been taken and smashed into a million broken pieces. I cried until there were no more tears. God did something to me in that closet, in the midst of my tears and rantings, He tenderly took my heart and placed it in His hands. He assured me that He was at work, that this too was in His plan. He took a heart that was so angry and hurt and changed it into a heart filled with love, even joy and especially peace. I prayed for Tom Sooter. I forgave him as well as the discipline committee. I confessed to Him my sinfulness, my pride, my arrogance, and thanked him for using this to humble me, and to teach me to focus upon Him. God gave me such peace that I cannot describe it. He gave me strength to return to class and return to my job in the college cafeteria. He gave me strength to work with the new married President to carry out all the plans we had made for the Halloween Party a week later. (It was a GREAT one too!) Tom Sooter came into my office about five years later and apologized to me. I was able to tell him I had already forgiven him. 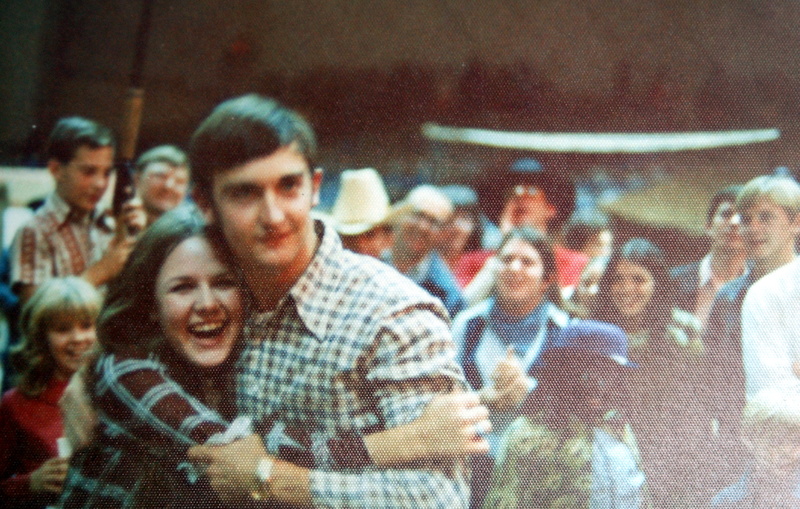 That one event had a profound effect upon my life and my relationship with God. It taught me to always seek Him fisrt in any conflict, and to seek to KNOW Him in that conflict. His purpose will be revealed as we humble ourselves to Him. His healing will prevail as we humble ourselves to Him. His Peace will prevail as we humble ourselves to Him. Jesus is the great mediator between God and man. I could have allowed my pride to encase my heart. I could have become resentful and bitter at what had happened. I could have let myself become jaded toward God and those ‘religious authorities’ He had set over my life. I would not be in the ministry today if I had. I would not have a soft heart toward God and His word today if I had. O brothers and sisters, Jesus paid a far greater price to secure your forgiveness from God! His love gladly overflowed in the supreme sacrifice. He now invites you to overflow with the same kind of love and glad sacrifice — not as a way to repay a debt, but as a way of joyfully reflecting and celebrating the love of Christ in your life. 3. Real peace requires an Ally. I’m sure all of us would love to overflow with this kind of love and ability to make peace. But the price of peace is often far too expensive, isn’t it? When we have been deeply or repeatedly wronged, the cost of reconciliation exceeds our meager resources. We have too little love, humility, compassion and forgiveness to cover the damage caused by sin and conflict. This is why real peace requires an ally. We cannot, on our own, fully pay the high price of reconciliation. We cannot wash away another person’s sins. We cannot cleanse our own hearts from bitterness and self-righteousness. We cannot forgive as God has forgiven us. But there is One who can do all these things, and he is eager to come to our side, bear the full cost of sin, and give us all the support and resources we need to restore peace with those around us. Only as I sought the comfort of the Holy Spirit as I prayed was I able to forgive and experience the Peace of God in the midst of such a traumatic experience. God would not be pleased to reconcile two people to himself, but leave them at odds with each other. His reconciliation is all-encompassing. Therefore, he is eager to come alongside each of his children and become our ally in pursuing peace with others. Your ally is ready to come to your aid. Seek his counsel; bank on his limitless resources; trust that he will never leave your side as you seek peace with others. 4. Real peace is found only at the Cross. The world offers many formulas for peace. Americans spend millions of hours and billions of dollars every year in bookstores, at seminars, in counselors’ offices, or in courtrooms, searching for ways to resolve conflict and regain some measure of peace. Most of this effort is utterly wasted, because real peace is found only at the cross. Colossians 1:20 teaches that it was at the cross that Jesus shed his blood to pay for our sins, purchase our peace, and reconcile us to God. This gift can be found nowhere else in the world. 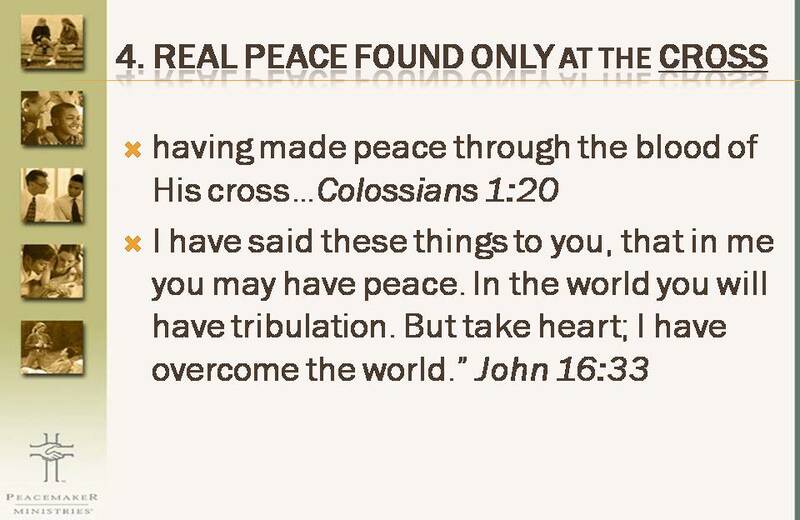 In fact, Jesus promises that we can find peace in Him, becasue only He has overcome the world! As Acts 4:12 proclaims, “Salvation is found in no one else, for there is no other name under heaven given to men by which we must be saved.” It is at the cross alone that the gospel of Christ is revealed: Jesus has freed us from the penalty of sin and given us the ability to break free from the sinful attitudes and habits that foster conflict and obstruct reconciliation. As you kneel at the foot of the cross, you will find inspiration, grace, and power to make peace with others. I know this to be true, for I have experienced it several times in my life. Take hold of the liberating promises of the gospel. Trust that Jesus has forgiven your sins, and confess them freely. Believe that he is using the pressures of conflict to help you to grow, and cooperate with him. Depend on his assurance that he always watching over you, and stop fearing what others might do to you. Know that he delights to display his sanctifying power in your life, and attempt to do things that you could never accomplish in your own strength, such as forgiving someone who has hurt you deeply. It is wise and helpful to learn and practice the peacemaking principles and skills that we are all studying in our Sunday school classes. But those principles and skills will produce only superficial results if they are not inspired and guided by what Jesus did for us at Calvary. Genuine, lasting peace is found only at the cross! 5. Real peace has Eternal consequences. Inherent in this gift of peace is the privilege and responsibility of sharing the message of eternal life with others. All this is from God, who reconciled us to himself through Christ and gave us the ministry of reconciliation: that God was reconciling the world to himself in Christ, not counting men’s sins against them. And he has committed to us the message of reconciliation. We are therefore Christ’s ambassadors, as though God were making his appeal through us. If you have received peace, reconciliation, and eternal life through Jesus, he calls you to share this gift with others. Although words alone will sometimes be enough to draw others to the Savior, Jesus taught that our most persuasive testimony is communicated by how we love one another. The love that is most eye-catching and persuasive to the world is NOT the love that we show to those who love us. As Jesus taught in Luke 6:27-36, anyone can love those who love them. What marks us as sons and daughters of God is our love for those who are in conflict with us. When we love and forgive those who have deeply hurt us, or humbly confess our own wrongs, we are demonstrating the reality and reconciling power of Christ in our lives. In doing so we are giving others a taste of the peace and reconciliation they can find in Jesus. 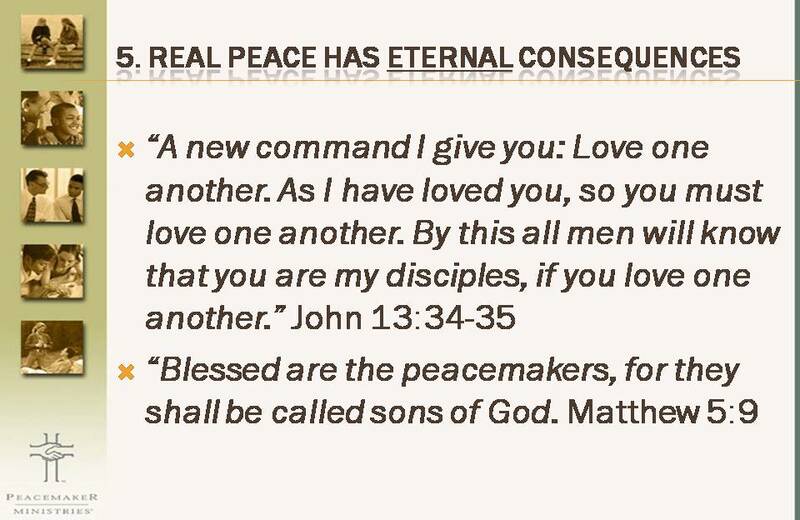 Thus God may use our witness as peacemakers to lead others to trust in Christ and find eternal peace through him. The world is hungry for peace! Not the superficial, temporary peace that millions of confused and misleading voices speak of day after day, but the deep, genuine, and lasting peace that God secured for us through the death and resurrection of his Son. 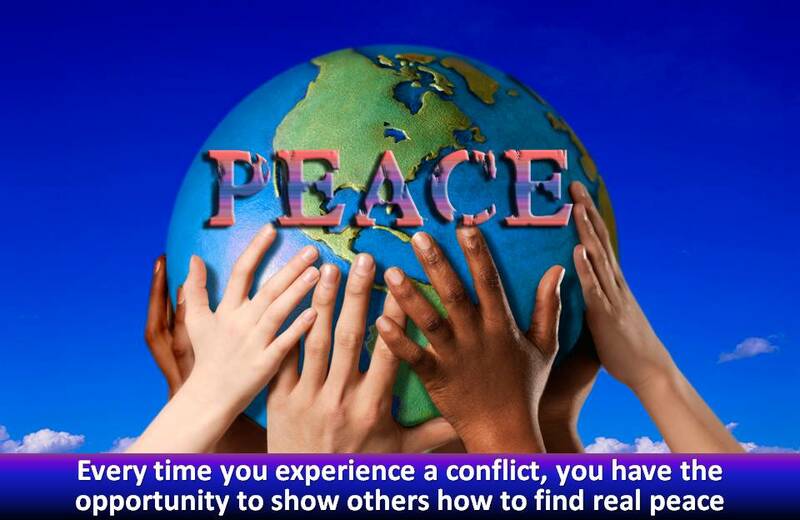 Every time you experience a conflict, you have the opportunity to show others how to find real peace. May God grant you grace to do so in a way that points clearly to our Lord Jesus Christ, the Prince of Peace. Challenge: Think of someone in your life with whom you need to make peace. Throughout this study, commit to prayer the steps you need to take to go to that person.